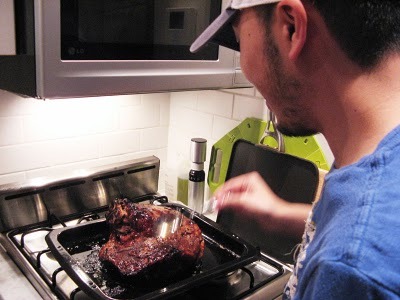 Recipe: Making Momofuku’s Bo Ssam at home for less than $20! 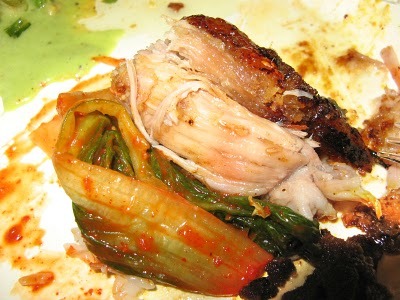 I’ve been asking my friend Fely to organize a Momofuku Bo Ssam dinner for a while, $200 for a whole piggy shoulder with 6-8 people seemed reasonable. Next thing you now, I nearly choke over coffee last week with his email entitled “momofuk U” dinner, LOL. Not vicious or anything, just a joke (for those of you who are a little sensitive, chill), but our frustration is understandable if you read the whole reservation process, which is very obnoxious and complicated as usual *rolling eyes*. All day long, Fely emailed us updates of our feast to come. It was like his baby for the day, a baby we were going to devour that is. 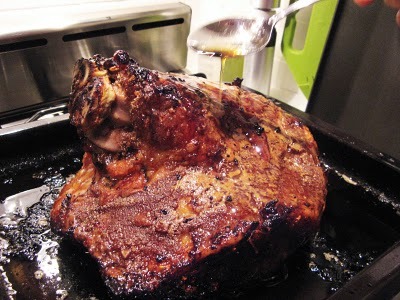 He spent 6-8 hrs caring for this scrumptious piece of meat. And when I arrived to his apartment, I was embraced by an amazing aroma in the air. 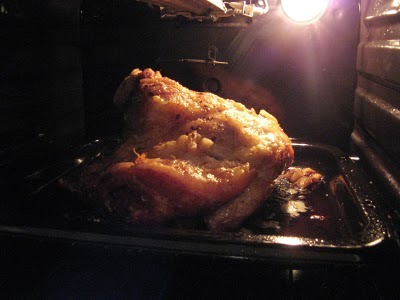 Here I was admiring and salivating while piggy spent the last 30 minutes in the oven. 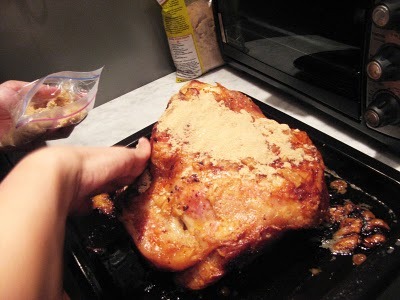 The Chef momoFely putting last minute touches, a coating of brown sugar, making it nice a crispy. 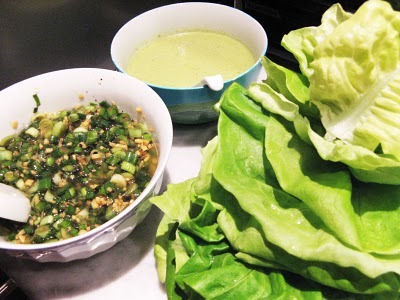 The prep for our bo ssam experience: bibb lettuce, scallion and ginger sauce, jalepeno sauce, and kimchi. We didn’t do the oysters, for no apparent reason, I guess we just didn’t think it was necessary. Overly joyful with what we had. Finally it was time to dig in!!!! it was some sort of torture to have to see it, smell it and not be able to eat it for almost 1 hr… but ohhhh yeah… that wait was totally worth it. 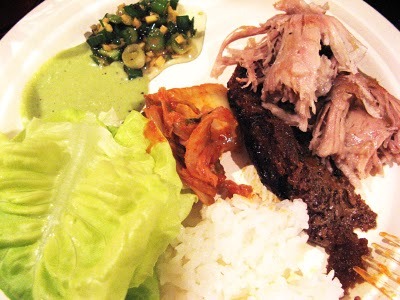 Tender juicy pork with a crispy sweet coating, soft fluffy white rice, spicy kimchi, and the aromatic scallion ginger sauce and a kick from the jalepeno sauce. Chef momoFely did it! This was soooo good and he paid $11 for the pork shoulder!!! So cheap?! 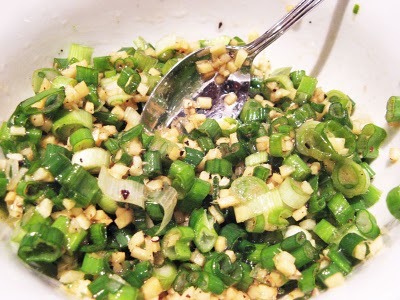 Well apparently even David Chang said so, as he gave his recipe on the Martha Steward show, he questioned why people payed so much for it at his establishment, when it is so easy to make at home. There was a lot of time and love poured into our dinner, we were all so very thankful. The final damage. Not bad considering it was only 1 guy and 5 chicks! I agree with the yummy ratings! it was fantastic! 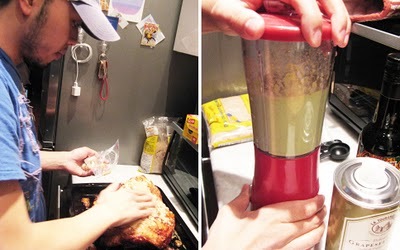 I want to try this at home too! 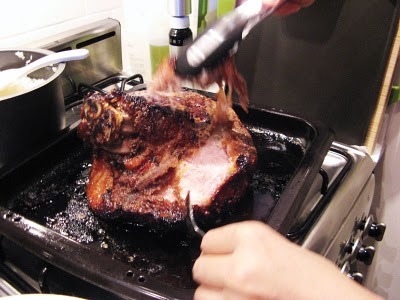 we should "encourage" fely to cook more !!! 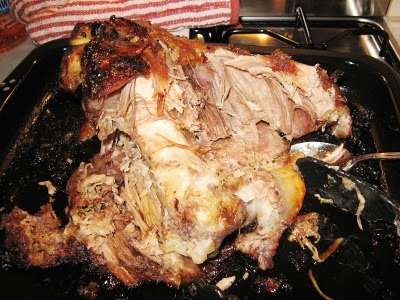 The pork looks great! it must be a really fun party too! I love making cooking the center of a party. Good food just makes the night so much more pleasurable. it was sooo good! and we had a lot of fun!